By: Vaughn Aaron Foster Sr. The Rev. Vaughn Aaron Foster was born and raised in Plainfield, New Jersey. He currently serves as Associate Pastor of First Baptist Church in Steubenville, Ohio. In addition, He serves as the president of Aaron Ministries, Inc. - a ministry founded to assist pastors and churches in their efforts to develop ministries that build people and change lives. Rev. Foster possesses a Bachelor of Arts Degree in Religion from Lincoln University, PA and a Master of Divinity Degree from Drew University, Madison, NJ. Presently, he is also working to complete his Doctor of Ministry Degree from Drew. In August 1991, he married his friend, Lisa D. Reeves. Together they are the proud parents of two sons, Vaughn Aaron, Jr. and Elijah Daniel. While ministering to many who, amid pain, persecution, trials and temptations, awaited God's intervention, Rev. Foster felt called to reach out to them and others who struggle with waiting for God. 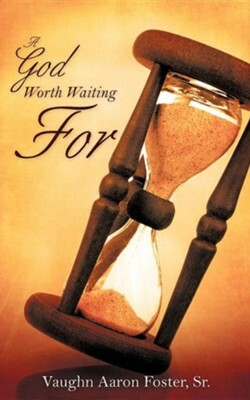 This book seeks to encourage the discouraged and give all who wait direction and reassurance. It does not seek to convince the reader that waiting on God is easy, but that the God of the Old and New Testaments is a God worth waiting for. I'm the author/artist and I want to review A God Worth Waiting for.